There are so many amazing Mexico landmarks around the country. I have a huge list of places around the country on my Mexico bucket list, but the longer I live and travel in Mexico, the more I realize how many little-known places there are that are worth my time. 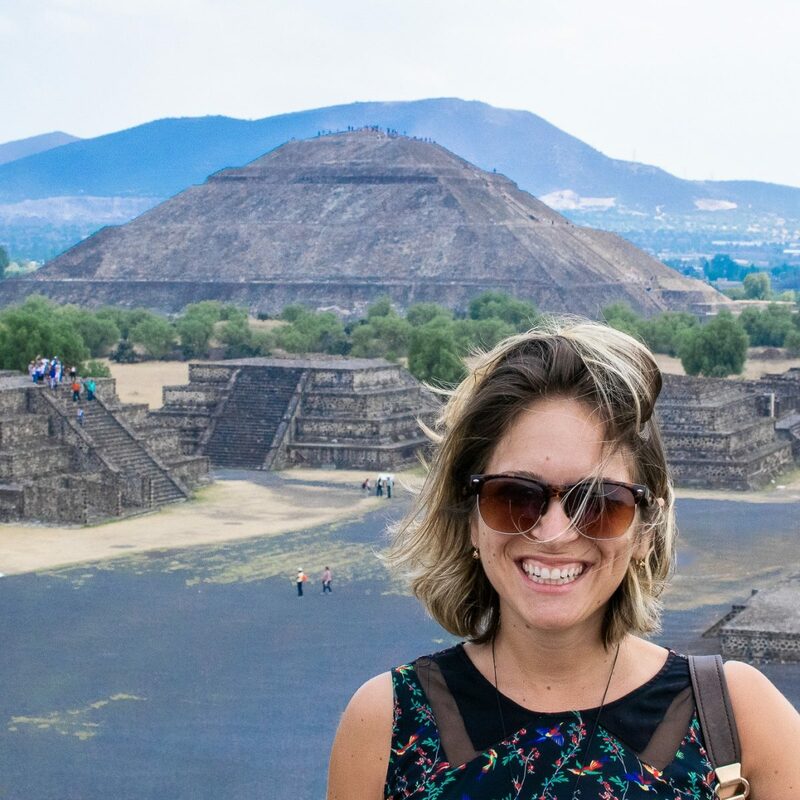 I’ve separated the list into manmade and natural Mexico landmarks so that you can find the places that suit your travel style best. 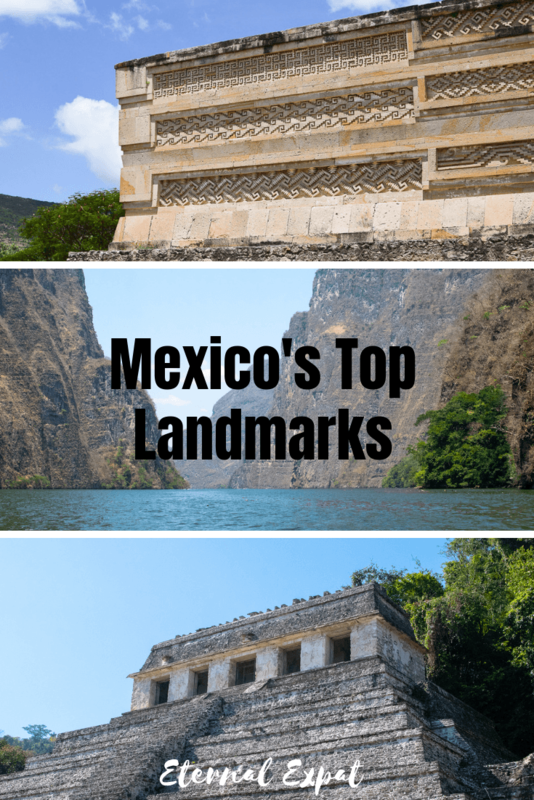 When I’m able, I have linked to other articles on my blog about these places so that you can do a little bit more research and learn how to get to these top Mexico landmarks. Most of the manmade landmarks in Mexico are ancient ruins that are well worth getting on a plane for. You may have learned about the Mayans and Aztecs in school, but what about the Olmecs or the Zapotecs? How would you like to visit cities so old, no one even knows who lived there? Mexico has all of the above. 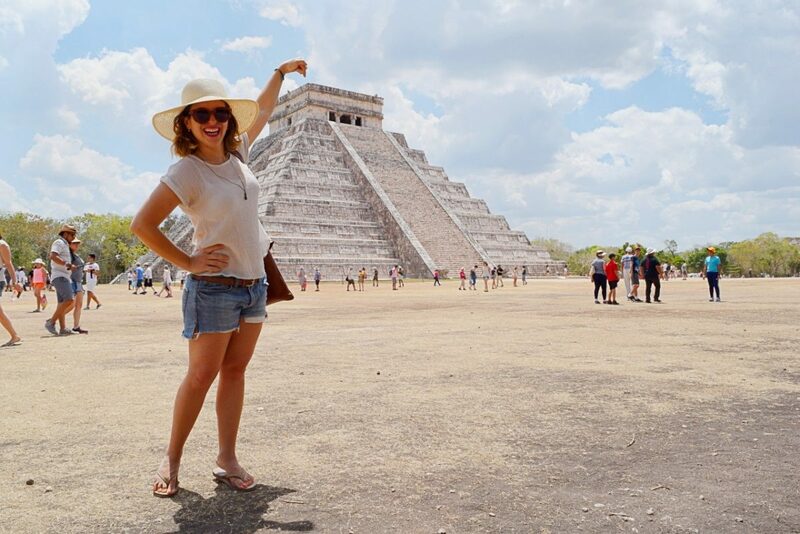 Perhaps the most famous ancient city in Mexico, Chichen Itza is worth the hype (in my opinion). It’s an enormously popular tourist destination, so if you want to enjoy it without a tour (and without tons of people), rent a car and go as early as you possibly can. The best place to base yourself for this trip is in Merida where it’s a short drive to this incredible place. Be sure to give yourself several hours to explore. Bring plenty of water (it gets VERY hot here). Pack a hat (or buy one for $1 USD outside) and pack a few snacks. Due to the sheer number of people that visit the site each year, you can no longer climb the pyramid. I’m completely biased since I live less than an hour away from Teotihuacan, but it’s one of the most incredible ancient cities I’ve ever been to. A quick Google search will yield you tons of results on the history of this place that many (incorrectly) think belonged to the Aztecs. This city is older than the Aztecs and no one really knows exactly who lived here. When the Aztecs arrived at this site, no one was here. These structures existed in what was, at the time, the middle of nowhere. I can’t imagine coming upon these giant pyramids without a single soul around. What a sight it must’ve been. I’ve visited these pyramids five times now over the last three years of living in Mexico City, and I’m in awe each and every time. I discover something new, a carving I hadn’t seen before or a faint painting that I’d previously just walked right past. It really is a can’t-miss Mexico landmark in my opinion and very easy to do from Mexico City. The widest pyramid in the world and the third largest by volume, Cholula isn’t the sort of pyramid you’re used to seeing. After centuries of neglect, what you see now is a really wide mound of earth. It looks more like a hill with a church on the top than a pyramid. What’s the point then? You might be asking. Because you can still go inside the pyramid. Which is something I’ve not been able to do in many other Mexico landmarks. You can walk through the labyrinth of walkways and tunnels beneath the pyramid which I seriously enjoyed. Not for those that feel claustrophobic though. I’m only 5 feet tall and I had to duck sometimes. 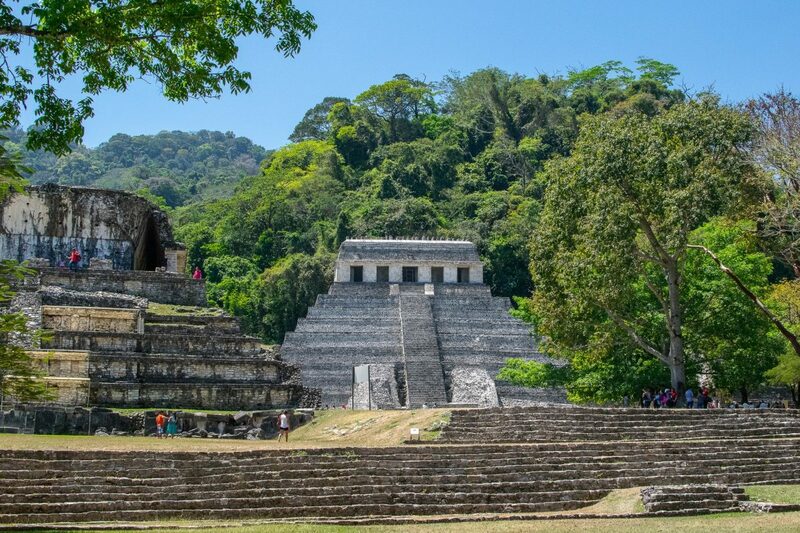 I heard about Palenque when I was visiting Oaxaca. Tucked away in the jungles of Chiapas, this site is one of the most picturesque on this list. It’s a little bit easier to get there than it used to be thanks to a newly built airport right in the small town of Palenque. 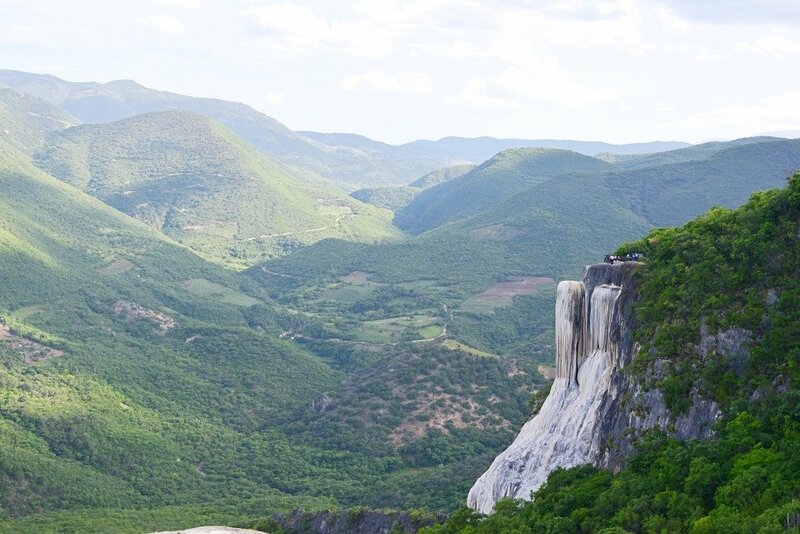 You can fly there twice a week from Mexico City on Interjet and a few times a week from Tuxtla Guttierez, the capital city of the state of Chiapas, with Calafia Airlines. 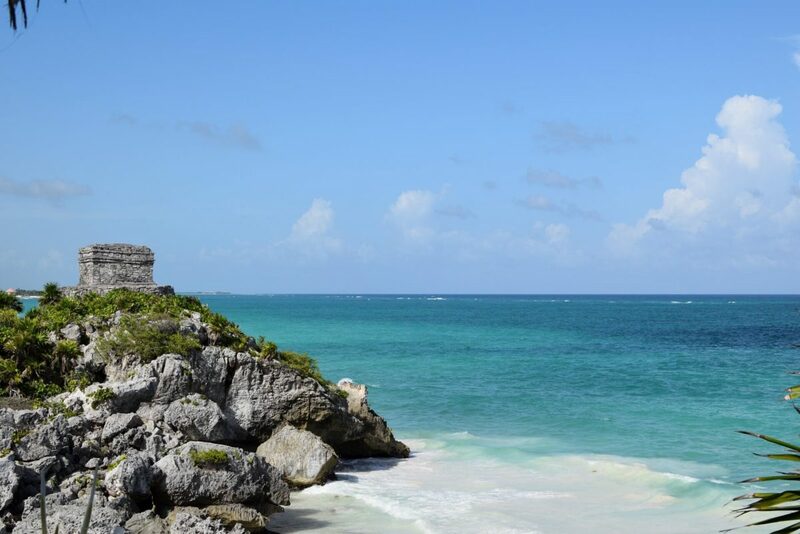 Regular readers know that I love Tulum (the town in particular, not the bougie beach resorts). It’s one of the most beautiful beach towns in the world in my humble opinion and although fashionable New Yorkers are flocking here during the winter months, there are still plenty of relaxing and out-of-the-way places to nestle into on a trip here. The real reason to come to this little slice of paradise, besides the cenotes, turquoise waters, and delicious street tacos, is for the Tulum archaeological site. It sits along the coastline in stunning contrast to the colors below and is one of the most breathtaking places in Mexico. It was a sacred place for the Mayans and it’s not hard to see why. The ancient ruins in the Yucatan are abundant and beautiful, but it can be hard to decide which ones to check out. Besides Chichen Itza and Tulum, I also highly recommend making time for Uxmal. It’s far less touristed than the other two and yet equally as beautiful. Archaeologists believe that Uxmal was one of the most important Mayan cities that still stands today. The Pyramid of the Magician is unlike any other ruins I’ve seen around Mexico and if you head here around sunset, you’ll get some spectacular photography. I highly recommend renting a car from Merida or Cancun to get here. It’s only about an hours drive from downtown Merida, making it a very easy day trip. While this isn’t the most popular Mexican landmark in the state of Oaxaca, I prefer it to the other more famous sites. 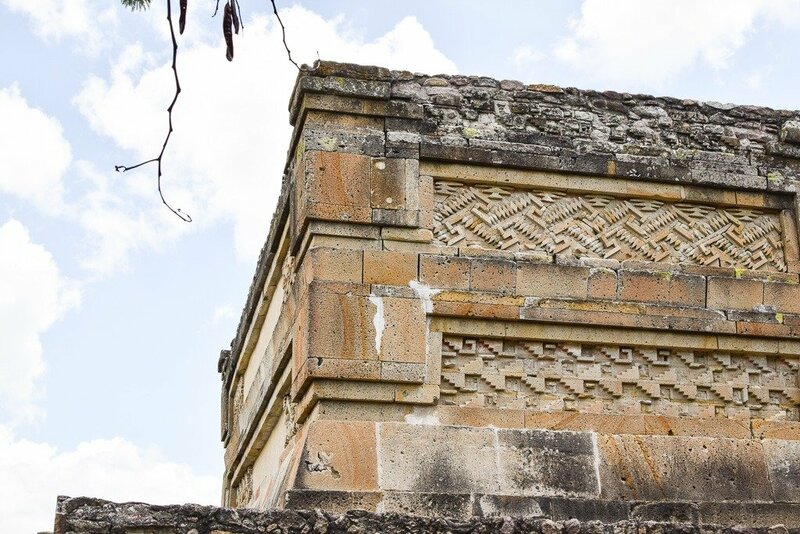 The easiest way to get to Mitla is by taking a tour. I used Bamba Experience, but you can book with anyone once you arrive in Oaxaca. Tours go here every day of the week in both Spanish and English. While I don’t always love tours, I do love to learn a bit more about places like this, places that I know absolutely nothing about. We had a wonderful guide who truly loved talking about these ruins and had a lot of knowledge about them. 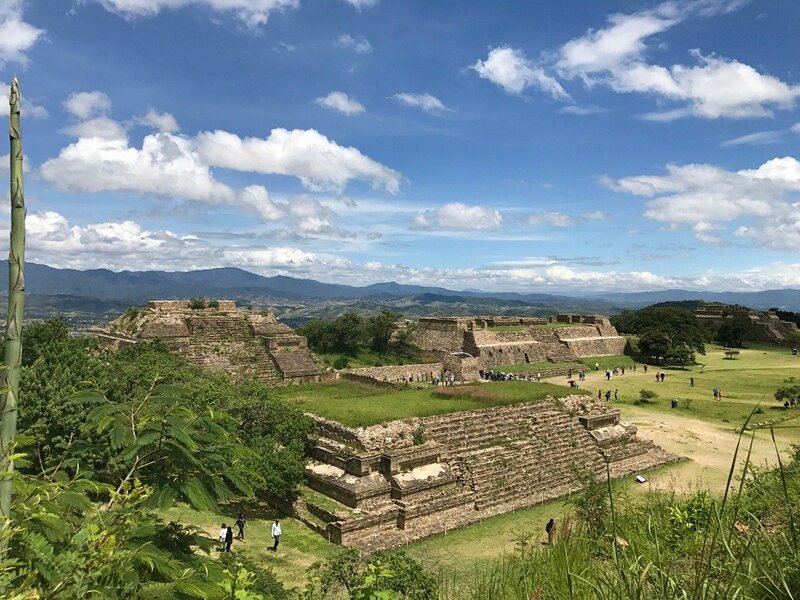 Monte Alban is one of those “must-visit” Mexico landmarks that everyone will tell you about when you go to Oaxaca. It’s very easy to get to and is a very beautiful site. I especially recommend visiting after the west season has just ended (October or November) when the grass is at its greenest. It’s one of the oldest sites in Mexico. Many archaeologists believe people began living in this area around 500 BC and its estimated that it had a population of almost 20,000 people. That means it was also one of the largest Meso-American cities at this time. While manmade Mexican landmarks are spectacular, there are also some absolute awe-inspiring natural Mexico landmarks that I think you cannot miss out on. Copper Canyon, so named because the Spanish thought that the lichen along the ridges was copper, is one of the deepest canyons in the world. It’s actually six canyons and six different rivers that all join together. The most popular way to explore Copper Canyon is to take El Chepe, the train that runs along the canyon and stops in a few of the small towns along the way. Use some of these towns as bases to explore the canyon by either hiking, biking, kayaking or horseback riding. Just be sure to stick to the designated paths and with a guide when possible. I have never seen anything quite like Hierve el Agua. This mineral formation looks like a waterfall, but in fact is not water at all. The water boils from the top of the rock faces and as it drips down the side of the mountain, the water evaporates and leaves mineral deposites along the way. From far away, it’s beautiful, but from close up, it’s cool and mystifying. Often added to tours of Mitla, Tule is the widest tree in the world. It’s also pretty tall and historical and in a cute little town in front of a cute little church. I probably wouldn’t go out of my way to go to this tree alone, but as part of a wider tour, I really loved seeing this stunning piece of nature. 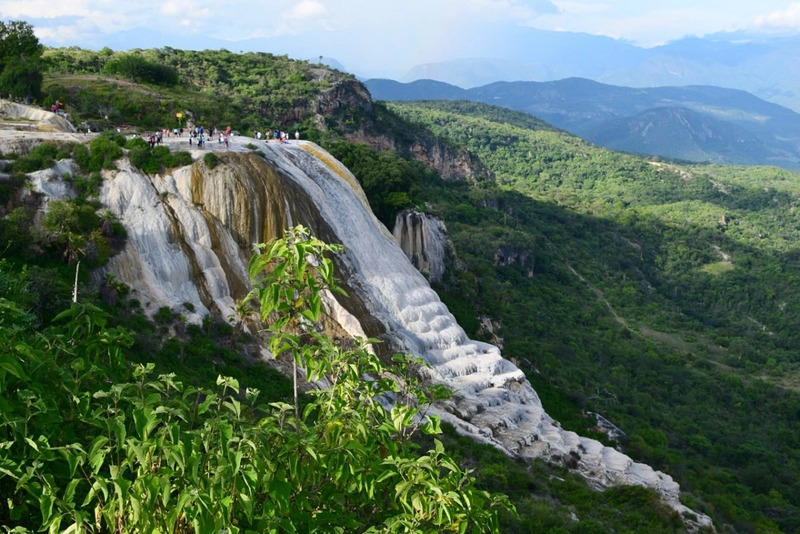 There are so many natural Mexico landmarks that you can’t miss around Chiapas. The state is the poorest economically in the country, but in my opinion, one of the richest in natural beauty. It could really use your tourist dollars and you won’t regret spending a penny of it when you see places like Agua Azul. These blue cascading waterfalls seem endless. You actually start at the bottom and walk up a sort of wooden boardwalk/staircase that has been set up for visitors. As you get further up, you eventually reach quieter pools where you can swim and relax without all of the hustle and bustle of the other tourists. 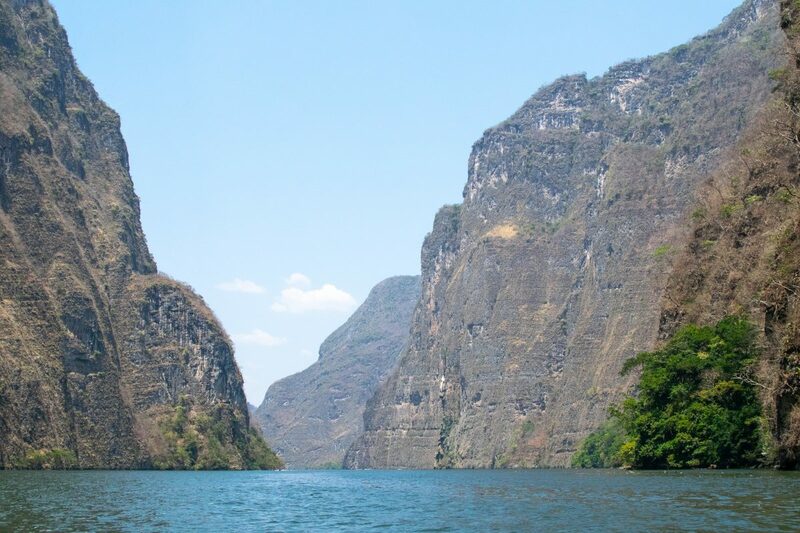 Another natural beauty you shouldn’t miss in Chiapas is Sumidero Canyon. You see if best from the water. Grab a tour from pretty much any tour operator in San Cristobal de Las Casas. Although it’s closer to Tuxtla Guttierrez, it’s actually easier to get a tour from San Cristobal. It’s also slightly more expensive to get a ride from Tuxtla than from San Cristobal. Once you get to the little port town, you’ll hop on a boat and ride through the deep canyon where at one point, your at the base of a wall that is over 1,000 meters tall. Nothing like mother nature to make you feel small and insignificant. The views from La Bufadora – I couldn’t get over how blue the water looked from here. La Bufadora is located just outside of Ensenada in Baja California. This is the second largest marine geyser in the world and at high tide or during rough seas, is one of the most impressive blowholes you’re likely to see. Visiting at low tide is a bit of a let-down, so try to time your visit as best you can. Also, don’t expect huge gushes of water every moment. You have to wait for the pressure to build up before a big blow occurs. Even if you can’t quite make it for high tide, the trip is worth making for the stunning views and beautiful coastal road. 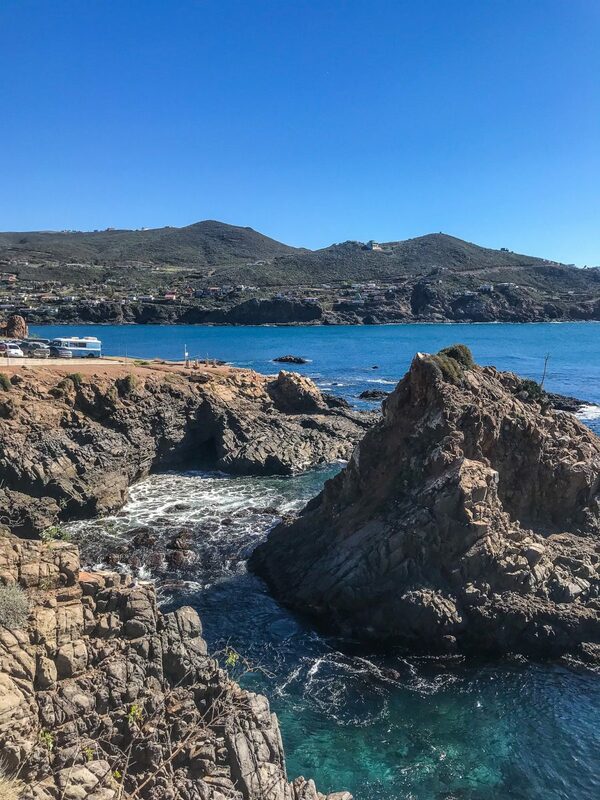 The drive from Ensenada to La Bufadora is stunning and on a sunny day the ocean against the rugged cliffs might just take your breath away (I know it did for me). I’ve been to a lot of these places but it’s amazing how many more great places there are to visit in Mexico. I guess I’d better start planning my next trip!